This Sunday, our Lenten journey brings us face to face with God's ever-present and inscrutable love and our response to that love throughout history. In our first reading (2 Chronicles 36:14-16, 19-23), we hear a condensed history of the repetitive cycle of the people of Israel turning away from God, God sending his love through his prophets to call them back, the people rejecting that love, then suffering the consequences of their actions, and then God lovingly restoring them into right relationship. In those days, all the princes of Judah, the priests, and the people added infidelity to infidelity, practicing all the abominations of the nations and polluting the LORD's temple which he had consecrated in Jerusalem. Early and often did the LORD, the God of their fathers, send his messengers to them, for he had compassion on his people and his dwelling place. But they mocked the messengers of God, despised his warnings, and scoffed at his prophets, until the anger of the LORD against his people was so inflamed that there was no remedy. Their enemies burnt the house of God, tore down the walls of Jerusalem, set all its palaces afire, and destroyed all its precious objects. Those who escaped the sword were carried captive to Babylon, where they became servants of the king of the Chaldeans and his sons until the kingdom of the Persians came to power. All this was to fulfill the word of the LORD spoken by Jeremiah: "Until the land has retrieved its lost sabbaths, during all the time it lies waste it shall have rest while seventy years are fulfilled." In the first year of Cyrus, king of Persia, in order to fulfill the word of the LORD spoken by Jeremiah, the LORD inspired King Cyrus of Persia to issue this proclamation throughout his kingdom, both by word of mouth and in writing: "Thus says Cyrus, king of Persia: All the kingdoms of the earth the LORD, the God of heaven, has given to me, and he has also charged me to build him a house in Jerusalem, which is in Judah. Whoever, therefore, among you belongs to any part of his people, let him go up, and may his God be with him!" 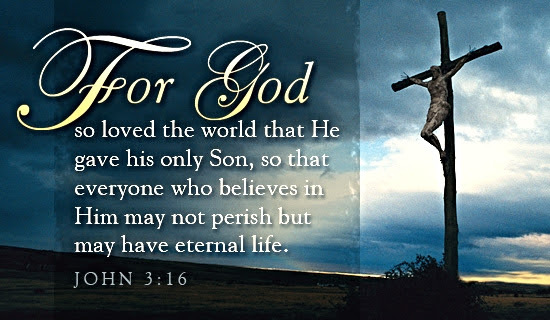 In our Gospel reading (John 3:14-21), we hear the well known passage, "God so loved the world that he gave his only son ..." but presented in the context of salvation history. The reading opens with a reference to Moses raising a bronze serpent on a staff to save the Israelites from deadly serpents (Numbers 21:4-9). And the comparison is made to Jesus, now being raised on the cross to save God's people from the evilest of all serpents, the devil himself. This passage also contains a warning that those to reject God's love condemn themselves. In our Epistle reading (Ephesians 2:4-16), St. Paul succinctly describes God's tender mercy and great love for us, even though we have sinned and turned our backs to God. Paul reminds us that even the faith we have is a gift from God, through no merit of our own. Brothers and sisters: God, who is rich in mercy, because of the great love he had for us, even when we were dead in our transgressions, brought us to life with Christ - by grace you have been saved - , raised us up with him, and seated us with him in the heavens in Christ Jesus, that in the ages to come He might show the immeasurable riches of his grace in his kindness to us in Christ Jesus. For by grace you have been saved through faith, and this is not from you; it is the gift of God; it is not from works, so no one may boast. For we are his handiwork, created in Christ Jesus for the good works that God has prepared in advance, that we should live in them.